If you've read previous posts on my blog, you will have worked out that I am obsessed with moisturising my body. It's a must for me. I literally cannot cope if I don't do this step after I'm out of the shower or bath, otherwise I just feel wrong. It's one of those things that I've gotten so used to after years and years of the habit, I feel incredibly uncomfortable if I miss it. This does mean that I am almost always on the lookout for good body moisturisers, or at least I was until I discovered the Life NK Ultimate Unwind Body Souffle. It wasn't the cheapest out there, but then again, it wasn't the most expensive, and my skin seemed to really enjoy it. Two tubs in, and I had decided that it was going to be the one. Unfortunately, when I went to buy my replacement third tub, I found out to my horror that it had been discontinued. I'm pretty sure I heard in my dazed state that Space NK have decided to discontinue their Life NK range altogether. How rude. So while the Kiehls Body Butter which was placed next to me would have been a quick thing to grab, I walked away to try and find a replacement (mostly because I think the Kiehls body butter is nice enough but so overpriced). I made do with a small travel sized Body Shop body butter while I sulked. 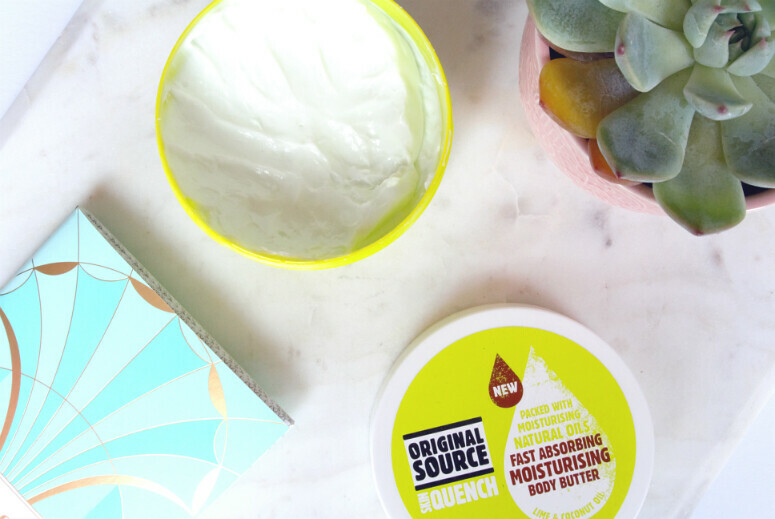 Then one day while I was wandering around Boots, I stumbled across the Original Source Skin Quench Body Butter and seeing that it was only £6, decided to give that a go. I decided to go for the Lime and Coconut Oil, and used it that night. Oh. My. This stuff is good. Seriously. I'll admit it's quite a stiff and slightly dry body butter in the hand, and very thick, but once massaged into the skin, it sinks in within seconds. It says 'fast absorbing' on the tin, and it really does do that. With Shea Butter, Coconut Oil and Avocado Oil, it's full of natural goodies that go all-out at moisturising the skin, and leave my skin feeling comfortable and hydrated, without turning into a greaseball. I'm not one for sickly sweet scents, so the Lime and Coconut Oil is perfect for me. It smells refreshing and uplifting, without being overly bearing. It doesn't quite replace the Life NK one that I miss, but it's a replacement that I'm happy to stick to, at least for now. Great hydration, fast absorbing, lovely smell and less than £10? I honestly don't see what more I could ask for. Original Source, please don't ever discontinue this one, ok? Oh my Original source soap are to die for! I cant fins this moisturiser in SG, looks very tempting to purchase!! Aw no, well maybe it will get to SG sometime soon, it's really good!